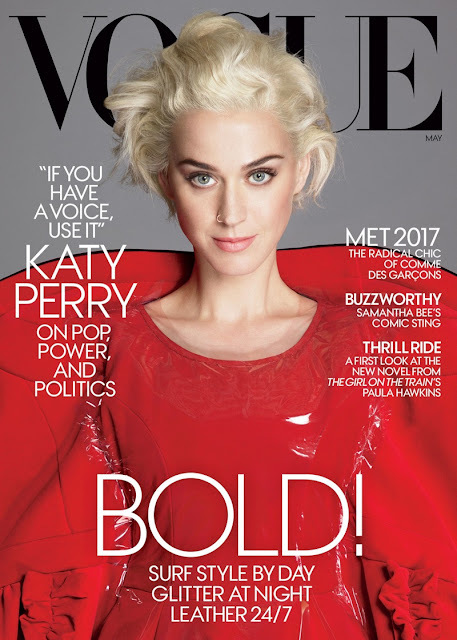 Katy Perry covers the May 2017 issue of the American Vogue. She looks super avant garde in a red design of the Comme des Garçons’ spring 2017 collection. She is lensed by the photographer's duo Mert & Marcus. Inside the magazine, Katy wears eight looks from the Paris-based label by Japanese designer Rei Kawakubo which is the subject of Spring 2017 exhibition coming up at The Met Fifth Avenue and The Met Gala. 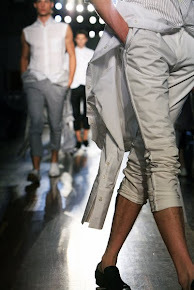 Read more on the exhibition Rei Kawakubo / Comme des Garçons: Art of the In-Between in my previous post. Fashion editor Grace Coddington selected bold shapes and colors from Comme des Garçons’ archive for the inspiring editorial in Vogue' May 2017 issue. Hair artist Julien d’Ys did an amazing job with the hair styles of Katy Perry in this editorial. Like a chameleon Katy Perry transfers in every photo of Mert Alas and Marcus Piggott. And the cover of the May 2017 issue of the American Vogue. Can't wait to get the issue and see all the photos of the editorial and the interview with Katy Perry and Rei Kawakubo.